The Detroit Lions opened and closed the scoring against the Minnesota Vikings in a defensive slugfest of a game as a Matt Prater field goal was all Detroit could muster in the first half. Minnesota responded with a HB Dalvin Cook touchdown run that gave the Vikings the lead heading into halftime. The Lions pushed ahead in the third quarter with another field goal and a HB Ameer Abdullah touchdown run followed by a 2-point conversion that would prove to be the difference, as the Lions would win 14-7. Attention shifted to an injured Cook following the game, and we’ll monitor his situation for you going forward. With that, we give you our PFF exclusive takeaways from the contest for each team. The Lions were treated to another great performance in pass protection from Lang, who kept a clean sheet 37 pass blocking snaps against the Vikings. Lang also graded positively with his 78.2 run block grade, second-highest on the Lions. Lang’s clean sheet is his first with the Lions this season, after allowing 10 total QB pressures through the first three contests. Stafford had his moments against the Vikings, good and bad, while the bad might have outweighed the good in this one, despite the victory. Stafford wasn’t as accurate as Lions’ fans may expect him to be, fielding a 65.5 percent adjusted completion percentage. Pressure got to Stafford as well as he was pressured on 35.1 percent of his dropbacks, completing just 2-of-7 passes for 18 yards and a 39.6 passer rating under duress. 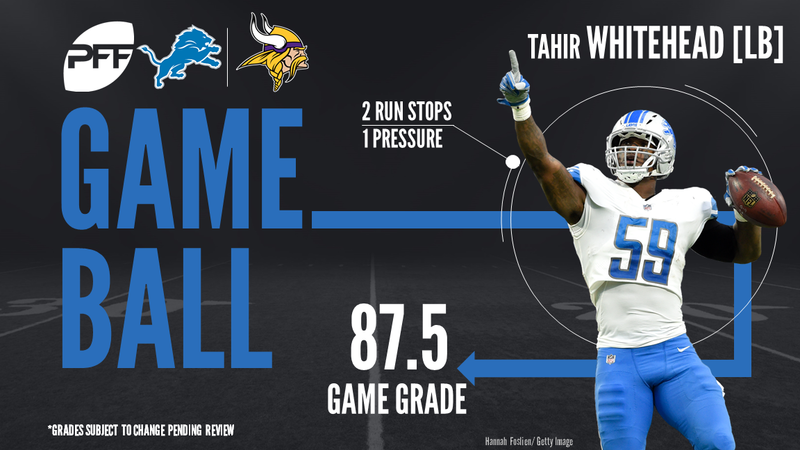 Whitehead generated a QB hurry on his two snaps rushing the passer but his ability to stop the run and make plays all over the field were a big factor in the Lions win. Whitehead produced two stops and three tackles in run defense. Whitehead dropped in coverage 28 times and yielded only two receptions. Killebrew was a playmaker in the Lions secondary as he generated two defensive stops and four tackles in run support while yielding no reception on two targets and 22 snaps in coverage. Diggs caught all five “catchable” passes thrown his way for 98 yards. 65 of those yards came while working in the slot. Diggs finished with a very respectable 3.38 yards per route run. Keenum finished 16-of-30 for 219 yards and was victimzed by two drops and sacked twice. Keenum finished 4-of-11 for 63 yards while under pressure. He shined after a play fake however, completing 6-of-7 for 41 yards using play action. In the end, turnovers by the Vikings offense was too much to overcome. Smith was able to register two stops in run defense against the Lions, both of which came while lined up in the box. He was targeted three times in coverage on his 35 snaps against the pass, allowing just two receptions for nine total yards, showing his ability to keep the offense in front of him. Hunter was a menace to the Lions offensive line and QB Matthew Stafford, registering six total QB pressures on his 33 pass-rushing snaps. Two of his pressures ended in sacks and he also registered a stop in run defense, proving his worth in both facets.